Lately, I've been converting my RX7 build into an engineering project, so please excuse my ramblings. This month's subject's been the fuel system. I had most of my fuel system purchased and accounted for, but when started going full engineer on it (I know, it's pretty backward from the standard engineering process... lol), I thought: "why didn't I do a returnless system?" -Use either custom machined fuel rails or my current FFE rails with FPDs on the "outlets"
*I considered using a variable resistor for infinite adjustability and accurate fuel pressure regulation, but I don't think anything is out there with sufficient range that supports the current needed to run a fuel pump. It's that, or use a series of resistors switched with relays, but that sounds like a pain in the rear to wire up and program. That, and I've also heard that Walbros absolutely hate being underfed voltage. I suppose you could use an undersized pump and overfeed it voltage, then lower it to suit the driving conditions, but the idea of straining the pump like that sounded less than ideal. So I decided on a pump speed controller which cycles the pump on and off to control flow. I've heard the cycles reduce pump life as well, but Aeromotive says its harmless... I might need to do some more research on that. Anyhow, this arrangement should do well enough for controlling a returnless system...? Like I noted above, I'm running an MS3-Pro, so I should have the computing power to manage it, and sufficient information from the rail pressure sensors and the MAP sensor. Pressure control would most likely be programmed so that it adjusts the signal to the speed controller based on rail pressures and then raises the target pressure as boost pressure increases. Hopefully there isn't too much adjustment latency though? Originally, I wanted an in-tank fuel pressure regulator to control fuel pressure to bypass the fuel. It would only have to bypass a small flow because of the pump speed controller, but at the same time, need to be large enough to allow the fuel feed to keep up with the engine, so I'd still end up with a large fuel pressure regulator anyways. The cyclic nature of the speed controller might cause small pressure fluctuations that I reckoned could be smoothed out with the fuel pressure regulator, so that I'd set the speed controller to flow just a smidge more than the pressure regulator needs. I couldn't find how to electronically adjust the pressure setting at the regulator though. Big turbo (read: high manifold pressures) applications live and die by boost referenced fuel pressure adjustment, and I couldn't imagine the delay caused by a vacuum line running from the manifold to the fuel tank being ideal. This might be alleviated by have a surge tank like the Radium Engineering unit with the FPR built into it and mounting it somewhere *relatively* safe and closer to the engine bay, but this sounds like a compromised waste of effort and messes with weight distribution by a little bit. I do still want to use a surge tank though. At the same time, it's possible to just use the ECU to change injection strategy to compensate for the pressure difference, but I don't think it'd run very well at high boost pressure. Having the ECU use a spare output to increase pump pressure as boost increases makes more sense to me. It's also mechanically simpler. I'm just hoping that the FPDs do enough of a job of smoothing out the pressure pulses from the pump. On that note, I read that fuel pressure fluctuation in applications with large injectors can still be significant with an FPD due to the use of PTFE-lined braided hose (less pliancy, less smoothing of pressure spikes). I'm going to be using stainless steel tubing with short flex sections of PTFE-lined hose, and my secondaries are monster 2000cc injectors, so this will probably be even worse than normal. I'm planning on running two FPDs, one on each rail, because of that. I'm just hoping that the pressure fluctuations from cycling the pumps won't make things worse. But if fuel pressures in the rails end up being a mess, at least I'll know why. -Is there any reason I should be concerned about using a returnless system in large turbo, large injector applications? I don't think the rest of the car community has dabbled with 2000cc injectors as much as us rotary guys (lol) but there's not much on this subject here. -I also read that you'd lose the side effect of a return system mixing the premix in the tank. At the same time, I've read that most modern synthetic premixes stay suspended in gasoline indefinitely. Should I forget it or would it be best to use a external-feed MOP adapter? If your ECU isn't set-up to control a returnless fuel system there is another easier way to do it. You put the fuel regulator/filter back at the pump/tank so you do have a very short return line to the tank (or within the tank if you prefer like F-body) and then you only have the high pressure feed line(s) going forward toward the engine bay. Now..... the only bummer is if you want a boost referenced rising rate regulator you need a long vacuum line from the motor to the regulator. You could use the old gas tank evap metal line if you aren't doing emissions equipment. i like the idea of going return less. it does seem like heating the fuel is a problem on some of the high HP builds. plus it should be simpler, lighter, cheaper and have fewer failure points. blueTII is right though, why not just move the regulator so its near the tank? Yeah. I'm a bit concerned on how tuning is going to work if the pressure regulator isn't boost referenced. It's my understanding that you want a sufficient pressure difference between the rail pressure and manifold pressure on high boost cars so that the fuel is injected properly (proper projection into the air stream, fuel atomization, fuel flow, etc.). I'm (tentatively) going with an EFR8374 and shooting for 400-450WHP on pump gas and water injection, which means I'll be looking at 25-30psi of boost: scary close to the factory fuel pressure. I could potentially see running a fixed, incredibly high rail pressure better suited to high boost conditions as another solution, but at the expensive of strain on all the involved components and having to run very, very short pulses at idle. That may not be the end of the world since I was considering using really small primaries. I'm using a MS3-Pro so I have flexibility on how it's set up, but I don't know if it'll run 3 stages of injection like I want it to, to smooth over the difference in primaries and secondaries (or tertiaries?). Deatschwerk's smallest injector of 440cc has an upper limit of 90psi of fuel pressure, which translates to 60psi difference at 30psi of boost, but I dislike running components so close to their operational limits. Regardless of how much I lower it, there will still be the pressure difference as boost increases (which I will have to calculate for) and a difference in fuel flow from that 30psi. I'm guessing the difference between 60 and 90 psi is about a 35-40% increase in fuel flow rate, which means the pulse will be really, really low at idle. Really really. And that's a bit scary since injector behavior gets unpredictable down there. Also, the idea of such a long line is clever, but freaks me out, reusing the old metal line or not (I'm keeping the charcoal canister anyways, in a vain attempt to pass a visual emissions inspection). I don't know how to quantify any effect if any, but I would imagine that there would be a slight latency in the reference pressure the regulator sees. I don't know if there's any fuel pressure regulators out there than can be electronically adjusted and I didn't turn up much from searching. Moreover, the idea behind deleting the pressure regulator was so that there wouldn't be any fuel bypassed anywhere in the system, reducing fuel pump exertion and thus the heat it rejects into the fuel. I did some more reading and someone mentioned that its use in motorsports greatly increases pump life expectancy off throttle (so, rally drivers). When you think of the kind of driving a big turbo car and its meaty fuel delivery system deals with on the street, it seems to make more sense telling the pump to ease up occasionally instead of making it work as hard as possible all the time for pressure regulation. Mazda's series 2 RX8 implementation used a fuel pump resistor and relay much like in the RX7, but with the pressure regulator built into the fuel tank sending assembly. I believe the regulator at/near the tank is a fairly standard application in most modern cars with returnless systems, but these are mostly NA cars. There are also "Fuel Pump Speed Modules" on some OEM implementations, but I haven't done enough research to know their exact workings. I'm guessing resistor still. Either way, everything would be fine and dandy if boost wasn't a key issue here, and a lot of it. I'm curious to see if any modern turbo cars are using returnless systems (i.e. the Ecoboost engines, VW/Audi's turbo line up, the Civic Type-R, etc.) and how they're implemented. *Minor quip, but a large driving factor for the motivation to go returnless is that I didn't want to bother sizing up the return line if I had to when stepping up fuel flow. Way too much effort for a hardly quantifiable performance benefit outside of your fuel system taking a crap. Last edited by pzr2; 10-07-16 at 01:47 AM. I hadn't really looked into implementing/modifying returnless fuel system, but a quick search shows some OEMs (Ford) are using a standalone pump controller that gets a signal from the ECU. So, you should be able to use an OEM pump controller and fuel pressure sensor and control it with PWM from the Megasquirt. This Locost builder did returnless with Ford components and the MS3. Also, you won't need that much boost on the EFR 8374 to meet you power goals. I did 420rwp in my TII with the smaller EFR 7670 and boost was 21psi at peak power. That's really interesting. I'll have a read through that thread when I've got the time. 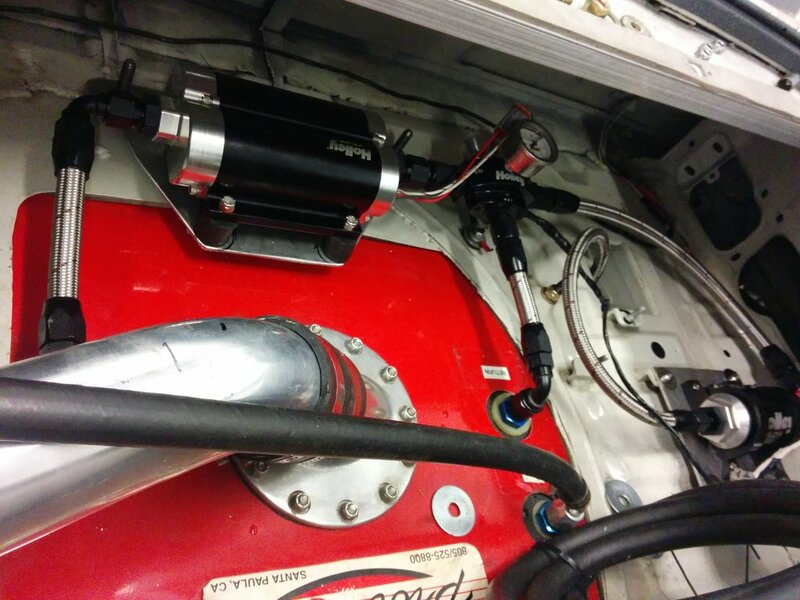 I happened upon the idea of using brushless fuel pumps the other day, which require a speed controller anyways. I looked at the Fuelab Prodigy first, but it seems like way too much pump (~400lph @ 43.5psi). It can take a PWM signal to a third terminal that tells the internal speed controller what to do so I can run it directly off the megasquirt, but the range is only ~70-100% from what I've read. I'll try looking at OEM pumps next. Oh, sweet. I was overcorrecting from the 26psi E85 EFR8374 tests from a while back that were at 500WHP because the highest readily available octane rating here in Arizona is 91 (where are all of you finding 93?). I'm loving this turbo even more. Again, when I have time, I gotta look through your build to see what you did. Nitpick: Most fuel pressure regulators are NOT "rising rate". They hold a fixed pressure differential from rail to manifold. So at atmospheric they may have 42psi rail pressure, at 10" vaccum they have about 37psi rail pressure, at 10lb boost they have 52psi rail pressure. The pressure differential across the injector is fixed at 42psi. This makes fuel calculation much simpler. Rising rate means the fuel pressure goes up out of proportion to manifold pressure. In that case, a 4:1 rising rate regulator would increase fuel pressure 40psi with 10psi boost, for 82psi rail pressure. This is useful if you are bolting a turbo onto a speed-density car with a stock computer and you need to cover added fueling in a cheap hacky way. Since the majority of us are not putting turbos or superchargers on Honda Civics or early 5.0 Mustangs, we have no use for them, and they should be safely left to molder in the pile of Speed Parts That Made Sense Once But Don't Anymore. Like in-cabin 5 gallon fuel cells that the driver would pressurize with a hand pump. Last edited by peejay; 10-16-16 at 10:02 AM. I was wondering if there was going to be anyone old enough to remember the old hacks of FMUs when I wrote that. Well, even the manufacturers call a "normal" boost referenced FPR a 1:1 rising rate. The rate of fuel delivery rises at a 1:1 ratio with boost. If it were a rising rate (synonymous with ratio) in the mathematical sense, the ratio of increase would be rising with boost and not fixed at 1:1, 2:1, 12:1 as they actually are. 1. Ratio – This is the ratio between boost pressure and fuel pressure increase. A 1:1 ratio means that for every 1 PSI increase in boost pressure, Fuel pressure will also increase by 1 PSI to ensure that the pressure differential between the inlet and outlet of the injector is constant. All injectors are rated to certain base pressure. Injectors are solenoid valves which open and close when power is applied to them. The injector has a solenoid which provides enough force to pull open the valve in the injector to overcome the fuel pressure keeping the injector closed. If the fuel pressure is too high, the solenoid will not have enough energy to open the valve fully causing the engine to starve of fuel. It is essential to maintain a constant pressure differential between the inlet and outlet of the injector and hence why a 1:1 ratio FPR is ideal. All Turbosmart FPR’s feature a 1:1 rising rate. No, it does not. It stays the same. 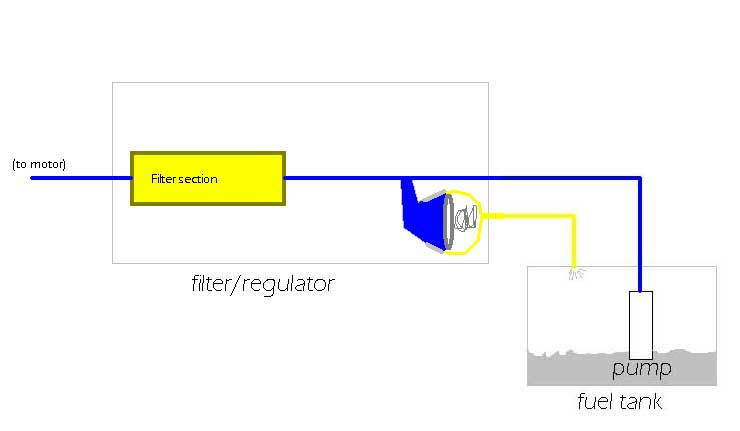 Flow through the injector is based on the pressure differential across the injector. (It's just an orifice, after all) You need to increase fuel pressure as manifold pressure goes up in order to make flow stay the same for a given open-time. If you go into GM computer with programming for a returnless system, you will find a maps for injector flow at various manifold pressures, because the lack of manifold referece means flow is not constant. 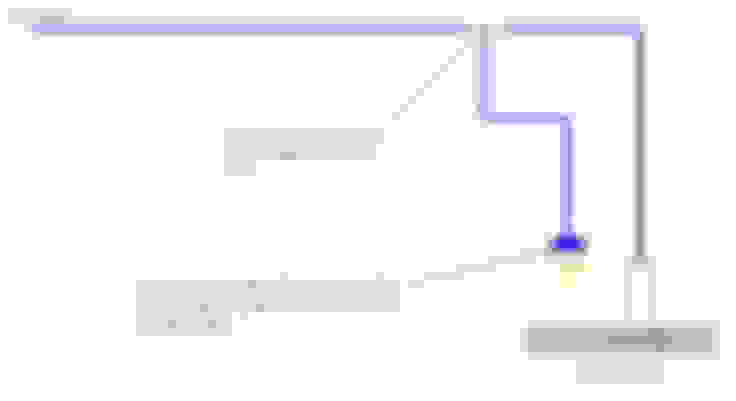 The same map on a return-style system has these fields all populated by the same number because the referenced regulator means flow across the injector is constant no matter the pressure in the manifold. In a local big power GTR on the hoist the other week - running a rb30 block with stroker crank. The way it was done there, fuel tank was remade in alloy, with a gravity well at the base of the tank feeding a few 044s (external) and also incorporating a rail with what looked like a Japanese reg. Suppose the downside there was the length of the reference line back to the manifold. i still think using the vapor line and putting the regulator near the tank is the simplest way, i'd totally do that. That's what Mercedes does, regulator is built into the filter back by the rear suspension and a vacuum line runs to it. BMW does the same thing, with the filter under the middle of the car. I still want an explanation of what Volvo does. My car has a regulator under the hood, vacuum hose goes to it too. 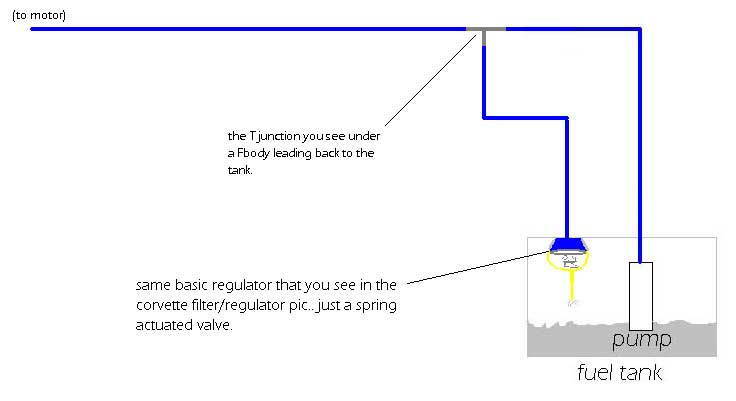 It's a returnless system, only one fuel line goes forward of the tank and the fuel line off of the filter has an orifice and a tee back to the sending unit. I have no idea of what sorcery is going on in this setup. Has anyone else ended up going the returnless route? How did it go? Did you end up running the vac line from the motor to the pressure reg at the tank?